For as long as fans of Lucile Hadžihalilović had waited for her triumphant return to the big screen following her staggering 2004 feature debut “Innocence,” the director needed to wait a little longer. Inspired by a nightmare she once had of being confined to an operating table, it was fitting, if unfortunate, that Hadžihalilović’s body had betrayed her on the eve of the premiere of “Evolution,” suffering a broken foot that prevented her from taking the stage at the Toronto Film Fest last fall. discovery of a lifeless corpse of a boy no older than himself inspires a crisis on the island as he and other boys start to wonder about how they’ve been raised, a red starfish found on the deceased’s abdomen setting off their imagination. 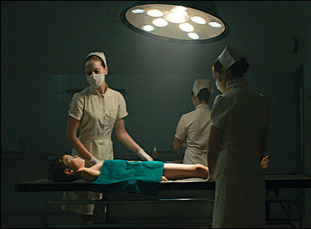 It is when the boys are shuttled off to a hospital for even more constant scrutiny that Hadžihalilović’s own ingenuity takes hold, as routine medical procedures and the relationships between the adults and children is subverted ever so slightly to pit the world we know against the one the writer/director has created, raising questions about accepting anything at face value, inspiring both sensations of awe and unease in what we see around us. Though “Innocence,” a haunting drama set at an all girls’ private school, and “Evolution” would seem to be connected by the formative age of the characters, it is actually Hadžihalilović’s reorientation of audience’s perception of nature that would seem to be her most consistent inspiration, a curiosity about the complexities of how human bodies work and our place on this earth amongst thousands of other species that makes the mundane seem otherworldly and unexpectedly suspenseful. As “Evolution” finally arrives on American shores, Hadžihalilović spoke about her ongoing fascination with the young, her references for the film’s arresting visuals and why some of the film’s most chilling sequences were the most fun for her cast. Is it true you had the idea for this before “Innocence”? Yes, in fact, it began before “Innocence,” with this [scene] at the hospital and the idea of a boy who goes there because he was feeling pain in his stomach. A strange thing is happening there and [I had] this idea of the boy with his mother, surrounded by young nurses. That in some way was the embryo of the story, but then I found the story that became “Innocence” and I put that on the side. Because of “Innocence,” I probably had a tendency to structure this with a group of people like “Innocence,” even if the project is very different and it’s not so much about a reflection of society, so when I came back to it, one of the main things I thought was it should not be a normal city and then I realized that it should have to be the sea, so then came the island. How did you find the island? We were very lucky. Quite early in the process of making the film, one of the producers knew the Canary Islands and had this idea that we might find the location there, so we did some scouting on a few islands — we found two villages – one in Lanzarote and another one on another island, and we had to choose which one would be the best. What I liked a lot in this village [in Lanzarote] is that it was quite familiar — it was very simple, very minimalist, very isolated and also it had this black coast, this volcanic landscape, which was very, very strong. Because we had the village, [that was when I thought] the film was going to happen because we had the place to shoot it. The color palette of the film, particularly yellow, is quite striking. Was it dictated by the island? It was obvious there was not much color in the island. There was the white of the village and the dark coast, so it was pretty much black and white, and as you say, there was a bit of yellow and red [in the] hills, but I wanted to have a lot of colors nevertheless. Of course, we could find elements with a lot of colors in the sea and under the sea. Red becomes a very important color because it’s very dramatic — and we could have this red starfish, and then we have the green of the sea and then I thought the hospital should become more and more aquatic, so it became more green. There’s that wonderful gruel that Nicolas eats too that’s green – if you’re at liberty to say, what was in it? Throughout the years, are you cataloging things that could have an alternate purpose in this reality you’re creating? I’m thinking of all the creatures you see in jars at the hospital, for instance. There are elements that are very classical. As you said, these creatures in the jar that you see in the hospital, it’s more that these things give me the idea, for instance, of the boys putting themselves in some kind of jar, like the water tank. These are very classical motifs that you play with and deform them and make them a bit more realistic or some of them more nightmarish. Probably the main element that was linked both to reality and to dreams was the starfish because it seems to be such a normal, familiar element. You have a lot of images of children playing on the seaside with a creature, but then when you look at such a creature, it’s totally alien and weird and fascinating, so during this year I worked on the project, it was very easy to find a lot of things under the water to keep our mind imagining things and to play with things which were real that become a bit more weird. You’ve said the painter Giorgio de Chirico was an inspiration for the film’s look? Yeah, he was Italian and painted architecture, which was very enigmatic with a lot of empty streets and a lot of sun and long shadows, but also towers or walls that were quite ominous. I had this reference before I knew the Canary Islands, so it’s different – it’s not the same type of landscape or architecture, but some characteristics I liked in these paintings about the mystery and the anxiety that comes from this place, I could find it in a bit different way with the same kind of mood as the de Chiricos. And [he is] a part of the surrealist movement that I feel very inspired by. There are other artists like Max Ernst or [Yves] Tanguy who were very inspired by the sea landscape, and the weirdness and the alien aspects of the very familiar elements that are seaside, so that was a reference. Your films have been connected to some extent by the age of the characters – what’s your continuing fascination with it? Somehow, again I was talking about the same thing, but this was [actually] in the continuity of the very first film I did, “Mimi,” which was also about a 10-year-old girl, even if that one was in a realistic world, not in an imaginary world. I guess I’m very interested about making films about children, probably around nine or 10 when it’s a moment when you begin to question yourself and what is around you, but you’re still very much a child. For some personal reason, I’m very interested in the thoughts, the fear, the expectations, the emotions of that age. 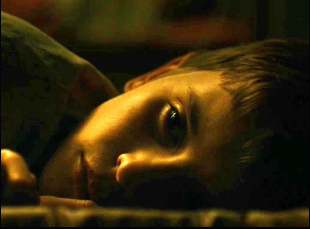 What was it like working with Max Brebant, the young actor who played Nicolas? In fact, he was not so young — he was 13 years old when we were shooting, so he was quite conscious about the fact we were doing a movie and that we were depending a lot on him and he had to be serious. A lot was about getting concentration from him rather than about the story because he didn’t care about the story. 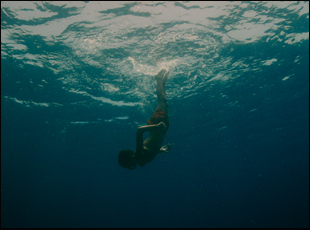 The idea of doing this film on this island and to swim in the water, to pretend to be sick in the hospital – it was fun for him. [laughs] It was not about what the film was talking about, it was the experience. When we began the shooting, I thought I would need him to look frightened many times, but this is something that was very difficult to play because of course, he was not frightened at all. He’s very confident, so the whole thing was about giving him a certain fragility because he has this little body and his expression is a bit more adult, and even [asking him] to play it poker face all the time rather than to express things, so it seems like he’s thinking a lot. I think the combination of these elements worked for me at the end and it was quite fun for [all] the boys to play this. In fact, the more bizarre the scenes were, the more they had fun. They loved to be in the water tank. They loved to be vomiting. They loved to be dead. [laughs] That was the funny part for them. They didn’t really realize what the story was about. And [Max], the boy who played Nicolas, read the script — I think he read it, at least he told me so — and he had questions about the injections [at the hospital]. He was afraid to get some injections for real, but [his questions were] also about who was going to be the girl [who would be doing the injections as the nurse], and I realized for him, the more real aspect of the story was this meeting with the nurse and the fact she was going to take him in her arms and swim with him under the water. He didn’t talk about it really, but I could see that was what attracted him to the story. Since you mentioned the hospital scene was in your mind from the very start – what was it like to realize that onscreen? It had been quite difficult to find the right place because when we began to do the scouting with the production designer, it was obvious we couldn’t choose a real hospital because I wanted to have a kind of abstraction. It’s a hospital, but at the same time, it’s something more mental, not something realistic. I didn’t want to shoot in a studio, so in the end, we found an abandoned hospital that was not too destroyed and we mainly tried to find rooms where the hospital structure was still there. We didn’t have to build anything really, but we could play with the colors and it was more about taking out than putting in, making the place very simple, very minimalist and very much out of time somehow. Is keeping a lot of room for the audience to draw their own conclusions something that’s important to you? I’m not trying to be too mysterious or too complicated. I always think at the beginning I’m talking about very simple and very universal emotions or feelings or ideas or situations. Of course, it happens in a strange, imaginary world, but this is more the superficial aspect, so I don’t have so much a feeling that I will demand too much of an audience. Then the end, I find out for some people, it’s quite demanding. [laughs] But for myself, I like as an audience that not everything is given to me. I don’t like when at the end of a story you understand everything and I put in some elements that are out of focus somehow. There is always a missing piece because then it stays more in your mind, not in an intellectual way, but more to project yourself into this universe or into these characters or into this place. “Evolution” opens on November 25th in Los Angeles at Cinefamily and in New York at the IFC Center. It will also be available on demand. Interview: Julie Dash on the Coming of Age of "Daughters of the Dust"
DOC NYC '16 Interview: Juan Reina on Digging Deep for "Diving into the Unknown"